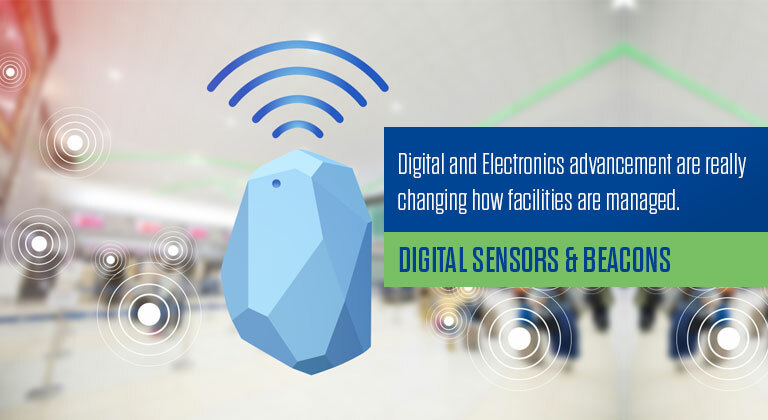 Space Utilization and Lower operating expenditure can be achieved in Facility Management with the help of Digital Sensing.Beacons and Sensor are the main heroes of Digital Sensing, it uses RFID tags and WI-FI connectivity. It is actually a boon for business leaders because it helps them in security, managing operating expenditure and inventory that automatically gives the best experience to the customers. Research conducted by CRE the NAIOP Research Foundation gives insights that how efficiently sensors can be used in CRE settings and determining the constraints that are incorporated with the networked data-collection system. The role of Beacon is the pass on the information to the mobile according to the specific geographical area., and the role of the sensor is to collect the information from the surrounding. The beacons and sensors are not used for a single purpose, its domain is spreading with the advancement in technology such as motion sensors are not only used for turning the lights on but it can also share and store the information. It is widely used in commercial real estate. In today’s world, its demand is increasing day by day that combines with the internet-based network to form a virtual ecosystem, in which a communication is established via network and data that is collected from locations get compiled and can be analyzed easily. The amalgamation of IoT with smart technologies that can help to organize the real-time information of business in a more efficient way. This can also be useful to optimize the energy and space efficiently. RFID tags can be installed with the hats or badges of the employees those who are working on site.It helps the owner to keep the track os number of workers working at a particular time and they can also track the time of arrival and departure of the employees at the working site. All these real time information will definitely give the currently required updates to the organization’s concerned authority, through which they can invest the human and financial capital in more strategize manner. The revenue generation of shopping malls can be increased with the utilization of these smart technologies that automatically gives the best ever digital experience to their customers by using Wi-Fi and GPS. These can efficiently gather the information about the likes, dislike and feedbacks of the customers in the particular geographic area of shopping malls. Mall owners can dive attractive discounts to their customers in a virtualized manner that helps them to understand the benefits which they will get from that offer. It is boon for both customers as well as for the mall owners. One of the famous and very first Beacon was introduced by Apple in Dec 2013. It can work with Apple’s iOS and Google’s Android. It is popular among customers because of its ease of use and reliable performance. The beacon using the iBeacon protocol transmits a so-called UUID. The UUID is a string of 24 numbers, which communicate with an installed Mobile App. Eddystone was introduced by Google in 2015. With the support of this Beacon can transmit 3 different frame types and it is compatible with both ios and android. Beacons with support from Eddystone are able to transmit three different frame-types, which work with both iOS and Android. A single beacon can transmit one, two or all three frame types. In July 2014, Radius Networks introduced ALtBeacon which is an open source beacon protocol and majorly known for its flexibility. Techno world introduced GEOBeacon in July 2017 which was specially designed for a very compact type of data storage. It provides high storage and with open source platform. The beacon generates a Unique ID number which helps the other device to identify it. Suppose a shopping mall have installed so many Beacons the all they have certain IDs, which are registered in the associated app. So that the smartphone can detect that ID and that particular mall. It totally depends on the programmer of an app and mall authorities to decide the ID. It can be done by using beacons which can be deployed in baskets. These beacons can connect with the sensors those who are tracking the movement of a buyer, understanding the shopping behavior of customer which ultimately help to analyze their overall experience. This can help them a lot to do required changes in their store so that revenue can be increased. Shopaholic peeps usually have foodie kind of nature, so that must be an advantage for them if they will get the food menu on their phone automatically with several attracting discounts on meals when they are in the range of a beacon. Give best ever experience at the time of shopping by keeping your kids engaged. All the data collected and analyzed about the customers should be managed properly and maintained with proper security. Ways suggested by NAIOP to protect the data of commercial real estate companies. 1.New security system based on IoT can be installed. 2.Create a more reliable system in which the fault of one component will not affect the other components of the system. All these benefits are giving leverage to the building owners be making them aware about the advantages of using sensors that gather the data and use it to make real-time decisions.